Tooling cost can be one of the key factors in selecting between different plastic molding processes. Rotational Molds and tools are generally far less expensive than injection or blow molding tools. Sterling rotational tooling engineers begin with a thorough product design review which helps determine the best mold option...cast aluminum, CNC aluminum, or a fabricated tooling. Sterling’s OneSource Tooling Program can save customers' thousands of dollars in mold costs by developing molds in-house as an integral part of the total project. Since the rotational process uses centrifugal force, not pressure, to fill the mold, rotational molds are relatively low cost when compared to other processes like injection and blow molding. It is important for customers to select the right type of mold for their application. Each mold lends itself to different types of products. 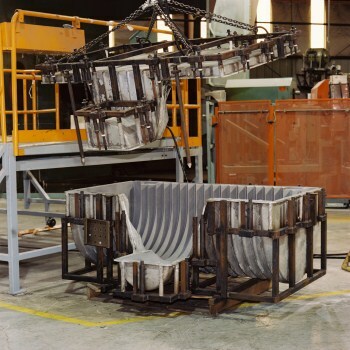 Cast Molds are the most common type of rotational molds to produce parts varying from very small to large. Cast molds produce parts that require considerable detail or elaborate shapes and they can be modified to integrate design changes. CNC Molds are used when extreme precision or extended production runs are required. Because of a higher cost, they are used only in special cases. When an part needs to be in production very quickly, machining the tool is sometimes the only answer. Epoxy Molds use a liquid thermosetting polyester and epoxy material that is formed and cured at room temperature. Fabricated Molds are the lowest cost tools and are used mainly for large parts with simple shapes. They're fabricated from steel, aluminum or stainless steel these molds and tend to be lightweight with a thin cavity wall. 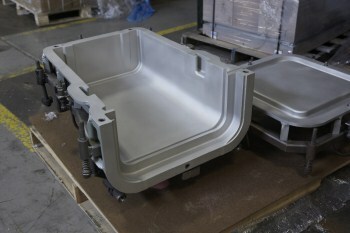 A fabricated rotational molding tool is the least costly approach for making with large simple molds.